Food is a drug. Break the shackles of addiction and learn to eat air! In this detailed guide, Dr. Robert Jones, MD, PhD, DDS, ODD gives you the practical, step-by-step advice you need to transition to the air-only diet. Q: Eating air? Are you crazy? A: I am a medical doctor with more than forty years of clinical experience. An Obesity Epidemic is sweeping across our great nation. Eating air is the answer. Q: Isn’t there a risk of malnutrition? A: Not at all! Air contains all the vitamins, minerals, electrolytes and essential amino acids your body needs. Q: A friend of mine went on the air-only diet and starved to death. Will I die too? A: Lies, lies and more lies! Propaganda spread by the agro-business special interests that run Washington. They will do anything to keep you down, in ignorance of the truth! A Million Dieters Can’t be Wrong! Lunge and Chomp — Learn the Secrets of Air-Eating Technique! The Twelve Steps to Food Freedom — Anyone Can Do It! The Hidden Menace in Our Society That Can Prevent You From Eating Air — and How We as a Nation Can Overcome It! An acclaimed pioneer in the field of Airitarianism, Dr. Robert Jones, MD, PhD, DDS, ODD has dedicated his life to freeing food-eaters from slavery to addictive caloric substances. That’s why he wrote Food-Free at Last–to expose the truth the agro-business special interests don’t want you to know. And that’s why he’s running for President in 2013. It’s time to put this country on a diet–the air-only diet, the only diet proven to work. It’s time to cure our great nation of the Obesity Epidemic sweeping from coast to coast. It’s time to end the oligarchy’s influence on our political process and bring true freedom back to America. Go the Power of Air! After completing my novel, The United States of Air: a Satire, my editor suggested I write this spin-off title as a way to promote the book. But Food-Free at Last has taken on a life of its own, and has become more popular than The United States of Air! When you wrote the book did you know you were going to offer it as an audio book? As a self-published author, it is very difficult to compete in a sea of a million other self-published titles. A quality audiobook, however, especially author-narrated, has the potential to lift me out of the Churning Amazon Sea and gain visibility. Recording and producing an audiobook at home is not for everyone. It requires a blend of acting and technical skills that not every author possesses. Recording and producing your own audiobook is a labor of love. It’s also a massive time sink. Don’t do it unless you love it. If it starts to feel like work, stop. Better to hire someone else than to produce a bad audiobook. What else would you like to share with readers about your audio book? This is a fun little satire with a serious message behind it. It will–I hope–make you laugh out loud. But it should also make you think. In 1985, I joined the local chapter of Vietnam Veterans of America. During family functions, members congregated and shared stories about their tour of duty. Wives often felt out of place during these discussions and soon migrated to other areas to discuss issues they had in common – leaving the men to talk about war. At that time, “Cherries” was a rough, first-person draft, and I donated a copy for the wives to read and pass around. It was a learning experience for all of us, and wives soon returned to our story telling sessions – having a much improved understanding of the jargon and acronyms – no longer feeling like outsiders. Many war veterans keep their experiences buried deep inside, either unwilling to share or unable to do so. I have received numerous accolades from veterans – thanking me for putting into words a story they’ve been unable to tell. “Cherries” has become a conduit for many veterans and their families…allowing them to come out from the dark and heal. This was my motivation for writing this novel. When you wrote the book did you know you were going to offer it as an audio book? I had traveled a lot for my employer a couple of years ago and got interested in listening to audio books on these lengthy trips. I thought it would be fun to create an audiobook version for my book and have it available as an MP3 vs. CD’s so listeners can easily download it to their portable players. When I held auditions for a narrator, I was in awe when listening to these various people reading my novel…it sounded like a brand new story and much more intense than reading the book. So began my quest to create an audiobook version. What else would you like to share with readers about your audio book? I have provided the first six chapters – both written and in MP3 format on my website. I have heard back from followers that when listening to the MP3 and then reading along, the book takes on a whole new aspect. The audiobook is unabridged, which means that the reading is word for word from the book…it is a treat to hear the different characters speak or to hear the emotion during the dialog. Try it and let me know what you think. See my link below. Question to ask: How long is your audiobook? 13 hrs and 31 minutes. The highly-anticipated sequel to an Amazon Top 10 (Military Science Fiction) is finally here. The Battle for New Earth breaks out into a full-scale war and introduces upgraded technology on both sides. Will the Resistance succeed in delivering the cure or will humanity finally embrace the inevitable? Join us for the adventure of a lifetime and remember: nothing grows unless it dies. I had a dream about a wolf-like creature sitting on a cliff. He appeared to be upset about his current state and wanted to change. I began writing down the story and also began working on a game based on this scene. After several years, I decided to write the story down in book format and publish it as an eBook. Now in eBook, audiobook, and paperback, LYCCYX Episode 1 has been downloaded thousands of times in more than a dozen countries. Episode 2: Rise of the Hyans has recently been released and Episode 3 is on the way. When you wrote the book did you know you were going to offer it as an audio book? Yes, although I did not know that until after I published the first episode as an audiobook. ACX made it easy to locate a professional narrator to produce my audiobook. 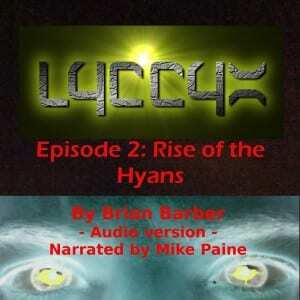 I now have a total of five audiobooks based on my LYCCYX Trilogy and my short stories. Everything was done in ACX (Auidiobook Creation Exchange) so the process was very streamlined. All you do is search for the books you have already published on Amazon and set up a listing for each one. You can search for a narrator or set criteria and wait for voice actors to find you. Try ACX at least once. They offer different distribution models with varying royalty rates. I chose exclusive and my books are on Amazon, Audible, and iTunes. Be sure to listen carefully to each chapter your narrator uploads. You might be surprised to find a few errors your editor may have missed or some areas that may need to be reworded. What else would you like to share with readers about your audio book? I would encourage everyone to check out the sample on the books Amazon page. Even if you are not a sci-fi fan, LYCCYX has something for you. There is action, adventure, romance, political intrigue, environmental themes and much more. I wanted to write Indian stories for kids ever since I attended a boarding school in the majestic Himalayas. The time I spent in the “school above the clouds” affected me profoundly, and once I returned home to North America I was struck by the lack of children’s stories from India available in our culture. Since India is such an incredible country, I decided to write a series of action adventure books for young adults about India to introduce young readers to this magical, mystical land. So if you’re looking for a great book adventure for kids, try Ghost Leopard today! When you wrote the book did you know you were going to offer it as an audio book? 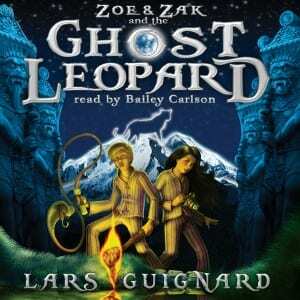 Ghost Leopard is a very cinematic book and lent itself perfectly to the audiobook medium. My production company produced the audiobook through ACX. The book is told from the first-person perspective of an 11-year old American girl. There are also many other characters such as the parents, Indian mystics, gods, and her mischievous co-protagonist Zak, an 11-year old boy. So it was a challenging project to find someone who could capture all of those voices. We auditioned several actresses and were thrilled to find our narrator, Bailey Carlson. Her range is incredible and she reminded us of a young Jodie Foster. Meghan’s graduation gift is one that any eighteen-year-old would dream of: traveling abroad to England. Her journey turns into more adventure than expected when Meghan meets the mysterious Kiernan and is introduced to a strange society hidden beneath the streets of London. When Meghan’s life is threatened, she flees the city and seeks sanctuary in a distant village–a place unseen by human eyes for over one hundred years. Not knowing if anyone can be trusted, Meghan tries to determine who is friend, who is foe… and who has captured her heart. Meanwhile, a battle for survival brews all around her. I had no idea it was even possible to create an audio book without the backing of a big publisher. I learned about Audible’s program for independent creation of audio books (www.acx.com) about six months after I published Wings of Shadow. I love the audio book format. When I am reading, I can imagine the characters’ voices in my head, but audio transforms novels to “in your mind” movies. I actually had tingles when I listened to some of the chapters that the narrator completed. She captured the romantic scenes perfectly, the humor and whimsy at other times, and brought the ceremonies and battles to life. Meghan Lewis narrated Wings of Shadow, and she was responsible for the many other pieces involved in its audio production. When I decided to create an audiobook, I went into it wanting to find the perfect voice talent, even if it meant a longer search process and production schedule. My biggest concern was finding a narrator who could handle my main character’s American accent, while developing accents for all of the British-sounding faeries. Meghan mastered this and intuitively knew when to add humor, an element of danger, and flirty romance. She is incredibly talented! I think the most important element in creating an audiobook is to find a great narrator. A talented narrator can bring the audiobook to life and a poorly recorded audiobook can ruin the story. What else would you like to share with readers about your audio book? Wings of Shadow was made eligible for the Whispersync program. Whispersync allows readers to buy both the ebook version and the audio version for a reduced price. With Wings of Shadow, it would only cost $1.99 to add on the audiobook. Readers can then switch between the two versions without the hassle of searching for the right spot. I love this option! Whispersync allows readers to workout, do dishes or drive to work, without having to put their books down. Wings of Shadow is also available on I-tunes and Audible.